Software – application integration, communication middleware, soft PLC and soft real time operating system. The version 5 of the tool for software applications integration – OpcDbGateway offers number of improvements in runtime, configuration and also in the auxiliary jointly distributed applications. One of the most appealing features also in previous versions was automatic mapping of address spaces of external OPC servers to the OpcDbGateway address space. The new generation of the product enables alike feature also for process databases – automatic mapping of database tables or vice versa – creating of tables according to the OpcDbGateway configuration. The latest OpcDbGateway version is available, and already tested for the latest versions of operating systems, Windows 8 and Windows Server 2012. Still it is not obvious that the products tested for operating systems for the x86 platform operate reliably also on x64 hardware platform. Putting new line of products for all kinds of platforms and versions of older and newer Windows operating systems was therefore quite time-consuming. Increased efficiency of runtime application in new version opens opportunity to use OpcDbGateway in more demanding applications with thousands of interconnected data points than ever. Better keeping of synchronous controller period means that OpcDbGateway can be seen as a soft real-time operating system. Possibility to use it in demanding applications is enhanced by the implementation of the new OPC client in OpcDbGateway. For each external OPC server in the version 5, multiple OPC groups can be defined in internal OPC client. It reduces unnecessary data transfers and thus increases the number of connectable data points and decreases demands on the hardware used. Very important aid for productivity increasing and configuration errors reducing in applications integration presented already in previous versions the automatic mapping of address space of external OPC servers and the configuration of external DDE servers to the configuration of the OpcDbGateway. Similar functionality for automatic mapping of database tables to the OpcDbGateway configuration was implemented in the new version of the product. It should enhance the desirability of OpcDbGateway for integrating real-time data with data from databases in business applications. Except of this, the OpcDbGateway configuring application allows now also the opposite process – the creation of a database table configured in OpcDbGateway configurator in the connected database. OpcDbGateway can work with many different databases using different database drivers now. Product combines sequential functionality (implementation of a sequence programmed or configured commands) and event-driven functionality. Events are initiated in OpcDbGateway by triggers. Triggering can be based on time or on an internal variable – memory operand value. Given the importance of this feature, extending functionality and more transparent user interface for configuring of triggers and events is a significant benefit. Triggers with period in milliseconds or in weeks and years. can be now configured in a single transparent manner. The monitor view in the configurator enabled in previous versions an option only to read OPC items by testing of a configuration. Currently, you can already also write OPC items, which eliminates the need for external OPC client for testing. Configuration application was accompanied by a separate output window with three tabs where you can watch status of alarm sources, read the contents of the attached databases by freely definable SQL queries and to monitor logging files in real-time. Users of OpcDbGateway can chose between two alarm systems. The first one is implemented according to the OPC AE specification. Alarming is there boundled with OPC items of the internal OPC server. It is usable together with OPC AE alarm client applications from different vendors. The second one is boundled with values of shared memory operands. Source as of the alarm in this case as well as a variable for alarm quitting is a memory operand. 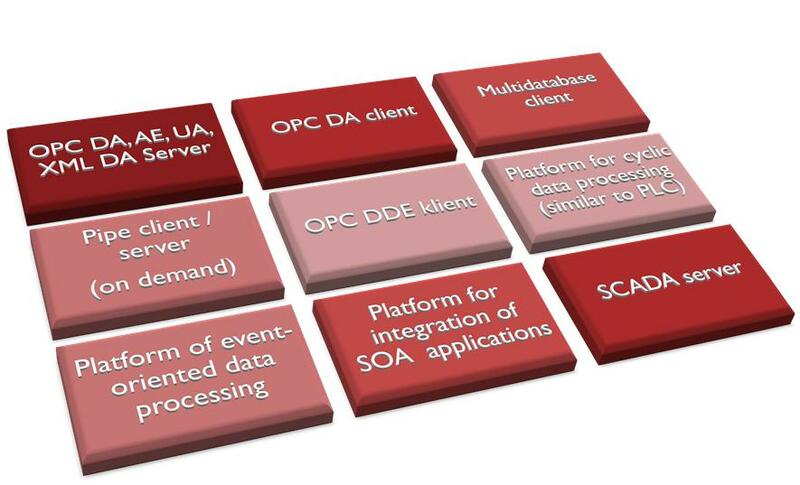 In regard of mapping of different external data sources as external OPC servers, OPC clients, databases, devices communicating using different protocols implemented within enhancing DLL‘s to the shared memory operands, this alarm system is very flexible. Except of this, it provides alarm history saved in process database and also in alarm log files. An alarm client in configuring application is implemented as an ActiveX. Customers can use this ActiveX in own alarm client applications as well. Sometimes small changes greatly simplify usability. Such simple improvement is structuring of system variables that enable powerful monitoring of runtime application through OPC server interface, according to the different categories in the directory structure of the internal OPC server in the OpcDbGateway. We believe that the new generation of product brings new application possibilities and satisfaction to users. Visualization, which need not be configured.